Dating from 1866 as engraved on the sidewall below the name "C.E. 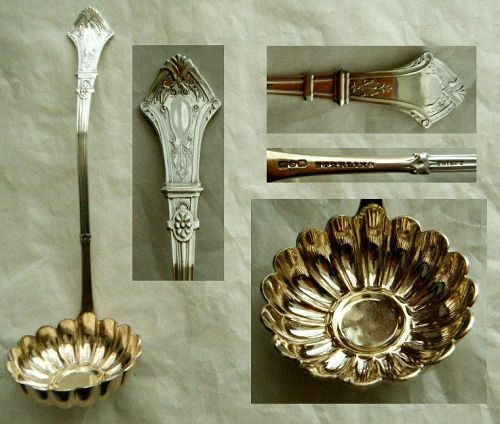 Mathews.," this coin silver mustard pot was made by Gorham. That company's "standing lion, anchor, G" mark appears on the underside of the base, along with the model number "510." It is a large, well-proportioned, and handsome item. Standing 4 1/4" high, it rests on a pedestal base that is 2" in diameter. The maximum span to the end of the handle is approximately 3 1/4" and the weight is just above 4.5 T. oz. 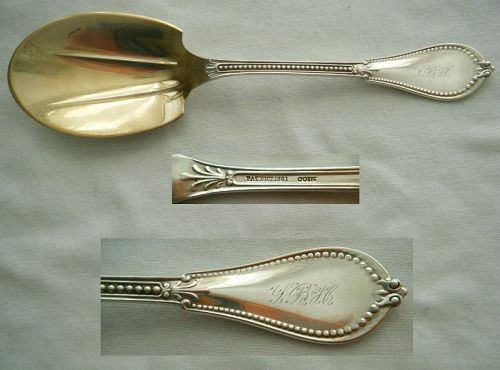 A large item measuring 9 3/4" long and weighing a substantial 3.1 T. 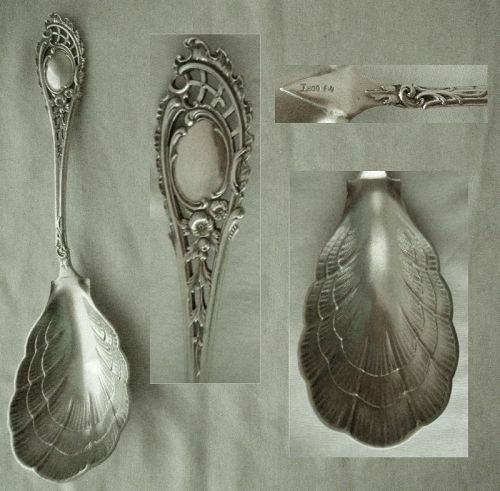 oz., this serving spoon is a premier example of 19th century European silver. 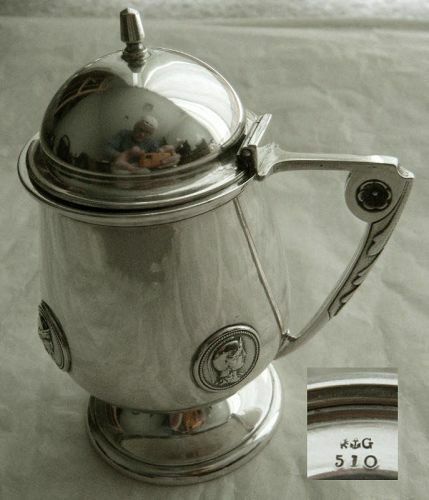 It is hallmarked with the "pedestal vase" symbol for the prominent Bremen, Germany, firm of Koch & Bergeld, as well as "800" representing the silver standard, and a "crescent" and "crown" for the national marks. 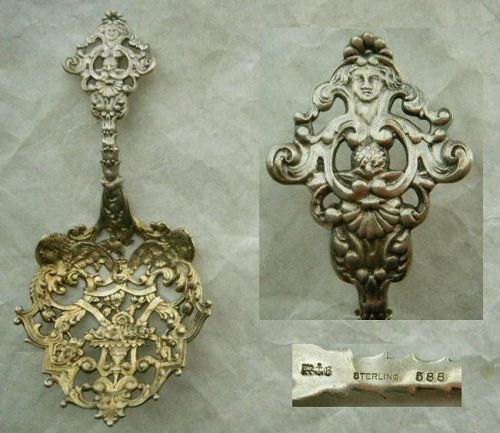 This particular configuration was introduced by the company about 1884 and that is also the approximate date of this piece. Price for the group of seven. 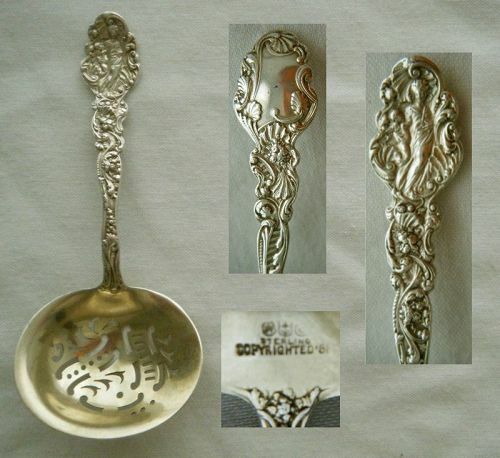 Dating c. 1860, these seven, coin silver, "Tipt End" teaspoons fall into two groups. 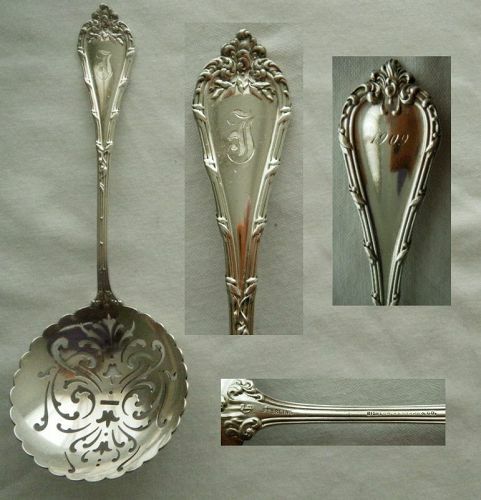 Three were made by Gorham, marked lion, anchor, G, and have feathered script "SC" monograms. They measure 6" long each, while the set weighs approximately 1.8 T. oz. They carry the retail name "Rhoads," for Charles G. Rhoads of Lancaster, Pennsylvannia.